I’ve resisted. Not that there was much temptation. I have thought the whole idea ridiculous from the beginning. But some weeks ago, I was given a large box of them and they have been sitting in the corner annoying me. Bags of “instant” luosifen (螺蛳粉). Please don’t misunderstand. I like luosifen. A lot. When it’s made properly. But making them properly is a mysterious process. The stock/broth/soup base is based on the local river snails (螺蛳). These are boiled, along with pork bones, for anywhere between 3 and 10 hours. Additional ingredients include black cardamom, fennel seed, dried tangerine peel, cassia bark, cloves, salt, pepper, bay leaf, licorice root, sand ginger, and star anise. No one really weighs or measures anything. Each shop ‘knows’ how much of anything is needed. There may be other ingredients, too. Once the broth is ready, rice noodles made from ‘old rice’ are added. 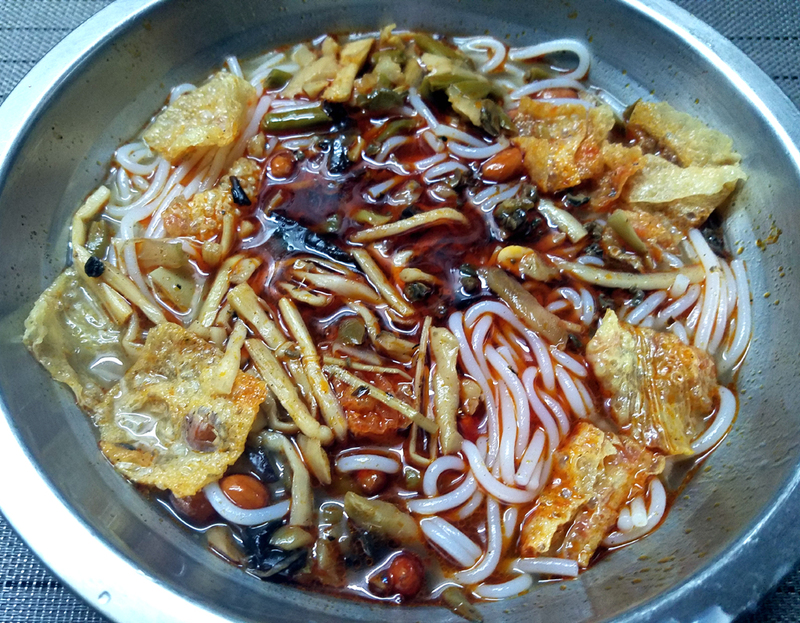 The ‘old rice’ gives the noodles a firmer, more chewy texture than other rice noodles such as those used in Guilin Mifen (桂林米粉), for example. 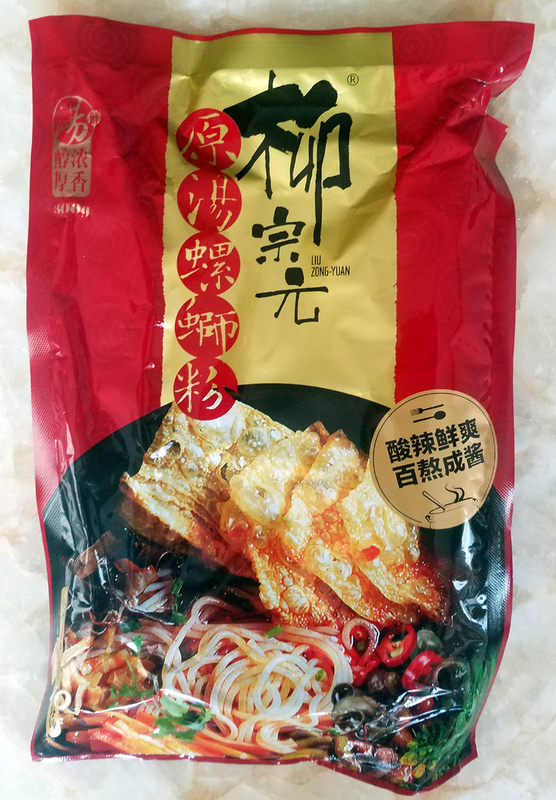 Alongside the noodles fried dried beancurd sticks, pickled bamboo shoots, black fungus, lettuce, peanuts and preserved cowpeas are also added. A hefty slug of chilli oil is necessary for authenticity. You may add more chilli, pickles etc to taste. Then you are ready to rock. To prepare instant luosifen, you boil the wrong noodles, drain then start again with new water and a bunch of gloop from plastic bags. So, yesterday I succumbed and decided to see what this miracle of modern technology would actually result in. What I had was this. 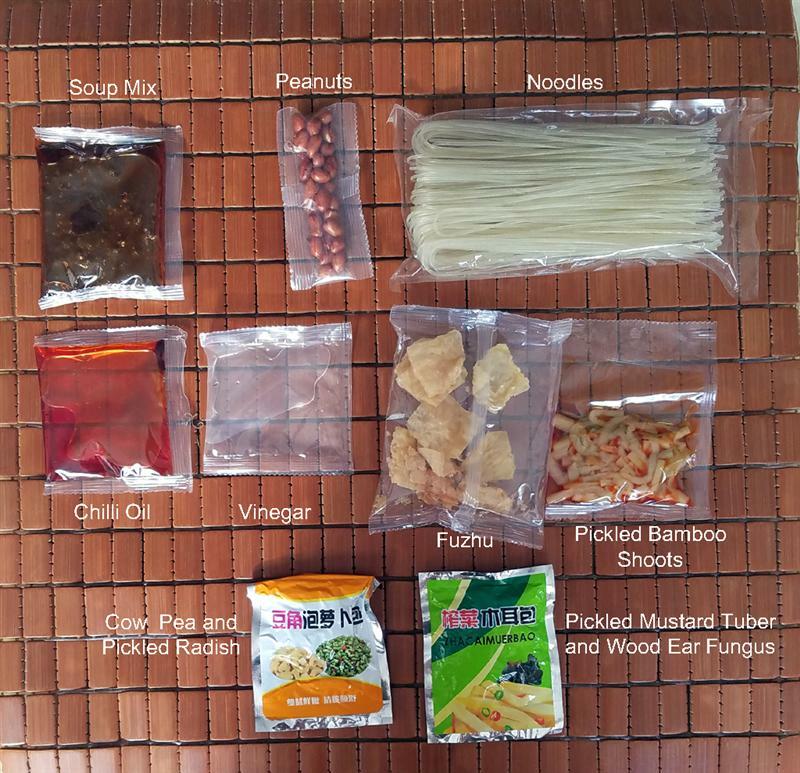 Sauce bag: fresh snail meat, vegetable oil, edible salt, spice, rock sugar, monosodium glutamate (MSG), chicken powder, bone soup, rice wine, cassia bark. The instructions told me to boil the noodles for 10 to 12 minutes (I choose the lower end of the spectrum), then drain and set aside. I was then instructed to boil 350 ml of water and add the soup mix. Stir until well mixed, add the noodles and the rest of the ingredients to taste. In the interests of boldly going, I added everything. I was convinced the 350ml of water was misguided but was determined to follow their recipe. Although the finished product looked right, it tasted awful. Massively over-salted, over MSG-ed and tasting of raw chilli. While a good luosifen does pack a clout of flavour, it is also full of complex and subtle tastes. This was just a hit to the head with a blunt instrument. This is one of the better brands, too. I’ve read a lot of the ingredient lists on these products and many don’t even contain snail meat – the whole point. This morning, to restore my sanity, I went out and had a good bowl from my favourite luosifen shack. My problem now is I still have eleven bags of the disgusting stuff. I’ll have to give them to people I don’t like.
. This entry was posted on Wednesday, August 15th, 2018 at 11:03 am	and is filed under Food and Drink, Strawberry Fields. You can follow any responses to this entry through the RSS 2.0 feed. Both comments and pings are currently closed. Now we all know what to expect for Christmas ! Looks as disgusting as you say it tastes and one wonders who , in a land of such wonderful cuisines , would buy this kind of stuff let alone use it , apart those like yourself , in the interests of greater enlightenment .